The ISFC's main aim is to verify and publicise the capture of specimen (i.e. trophy) fish caught on rod and line by anglers in Ireland, both in freshwater and at sea. The Committee also ratifies Irish record rod caught fish. What is a Specimen fish? 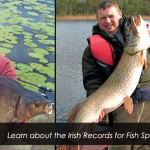 Even if you are only a casual angler, you are always likely to catch a big fish in Ireland’s productive rivers and lakes or in our marine waters. Your achievement can be rewarded by a unique awards scheme administered by the ISFC. 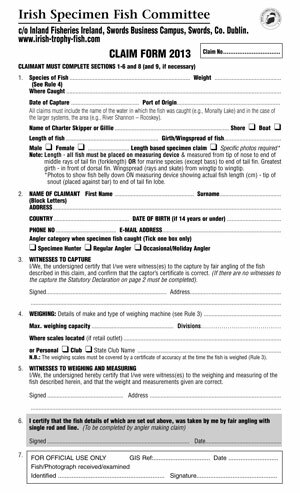 If your fish exceeds the specimen weight, a threshold weight set by the ISFC and representing large fish of the particular species, you can simply send a specimen fish claim form to the Committee for ratification. 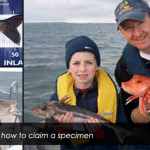 Information about your fish and all of the capture details will be published in the ISFC’s colourful annual report and you will be presented with a certificate marking your achievement and a special badge. The service is free and every year hundreds of anglers from home and abroad receive specimen awards. 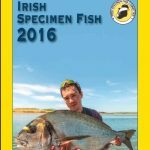 The ISFC also investigates and ratifies Irish record fish. Full details of specimen and record fish as well as a host of historical information about specimen fish is available on this site. Insert an advertisement Meizitang is specially designed to effectively absorb the oil from food, discharge of the body, stop the grease ingress, prevent the fat accumulation comprehensively, accelerate the excess fat decompounds and consumption, rapidly drive the trash and toxin away, get slim in short time by body purification and detex.